The fascination with gemstones has probably been one of the reasons why humankind started making jewelry. These creations of Mother Earth are stunningly beautiful. In Russian, for instance, they are called ‘Flowers of the Earth’ (Цветы Земли). This fascination resulted in multiple stories and beliefs which exist in almost every culture, ascribing magic and healing properties to precious or half-precious stones. And, of course, jewelry sellers around the world tell and retell these stories about the stones used in their jewelry. I do it, too. It is a good marketing talk. I even admit that some stones actually do have these magic properties – if the owner believes enough in them. Everything you believe in works for you – from religion to superstition. But my admiration of gemstones has always been more esthetic than spiritual. Until strange things started happening to me. I would like to share some stories here. Here is story # 1. Some time ago I had severe sleeping problems caused by MDD. I tried every possible remedy, including the stone therapy by wearing amethyst and putting it under my pillow. At the peak of my disorder nothing seemed to help. Later, when the physical problem started to subside, there was still need for some psychological support, especially when falling asleep. I found this stone in my ‘stone pile’ by chance. This Dumortierite was bought on an impulse, out of fascination with its smooth surface and deep blue color. I thought I might use it for some piece of jewelry, but the market seller said “It would be such a shame, such a smooth stone should be held in hand and admired for what it is”. I followed her advice. 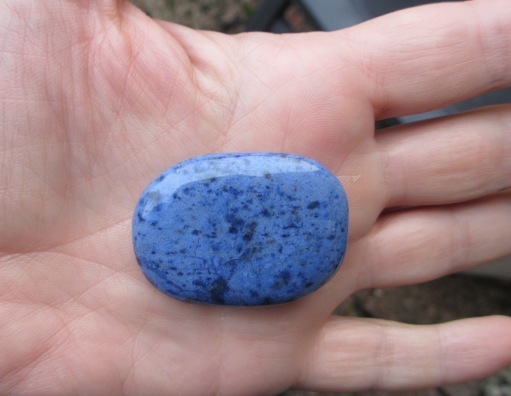 So this was the stone I picked one evening, without thinking too much, just feeling how cool and smooth it feels and admiring its soothing blue color before switching off the light. By miracle, I fell asleep in some 15 minutes after. So holding the stone at bedtime became a ritual, which helps me fall asleep night after night. Dumortierite must have some special properties, I thought and decided to search the stone info on the internet. And, yes, “Dumortierite is said to calm and focus you in traumatic situations giving you the tools to cope with a crisis.” Actually I did not knew it before, or, if I knew, I just did not believe it too much. Believing makes things work for you! Do you have another amazing, bizarre or just remarkable story about a gemstone in your life? Be free to leave your comments here. I am very curious about the real stories by real people beyond the marketing chit-chat.